Wednesday is the first day of China's Spring Festival travel rush, commonly known as "Chunyun." And Shanghai's railway station is bracing itself. On Wednesday, staff numbers will surge, with the addition of 320 college student volunteers and more than 300 armed police officers. 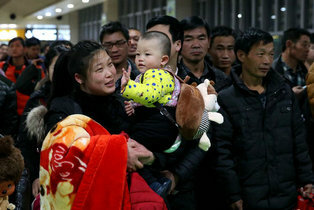 "We have dispatched volunteers and armed police in some key areas to help guide the flow of the crowd at the entryway, elevators and security checkpoints," said Li Bo, Shanghai Railway Station spokesman. To cope with the traffic, more trains have been added into the system during the 40-day travel rush. Numbers are expected to peak on Feb. 14, when 420,000 passengers are expected to pass through the three stations in Shanghai. More than 40 percent of the fleet are high-speed bullet trains, meaning many will get home quicker. "The quality of this year's ad-hoc trains is pretty good, especially those on major railway lines. The minimum speed is 120 kilometers per hour," said Li Jianfeng, from China Railways Corporation. This year, passengers were able to book tickets online, or by phone, 60 days before their trip. There is even a full refund for cancellations 15 days ahead of the trip, though this means more work for railway staff.